Technology changes quickly, as do the words we use to describe the tasks the new technology accomplishes. 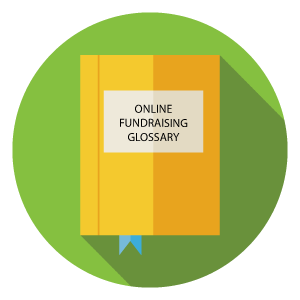 We put together this quick, easy online fundraising glossary to help our clients and the larger nonprofit community understand the many ideas involved in the current state of online fundraising. It is likely this glossary will change to incorporate new technologies and ideas as the industry grows and changes. The individual(s) that Fundraisers invite to visit their Crowdfunding and contribute. An individual webpage set up by a Fundraiser for the purpose of raising funds (and more) for your nonprofit. A social fundraising system that enables a nonprofit’s constituents to create their own individual webpage and invite their social network to contribute. Donor information is downloaded into DonorPerfect, while funds are automatically transferred to the nonprofit’s bank account. Fundraising and Donor Management system featuring the central data repository. A constituent that sets up a Crowdfunding on behalf of your nonprofit. The method in which nonprofits raise funds for their mission by asking constituents to contact everyone in their social network and promote the nonprofit’s mission, event, and/or goal. Everyone that a constituent personally knows, such as friends, family, co-workers, neighbors, club members, and other associates. A Fundraiser who creates a social fundraising team and establishes a team goal. Each team member creates his own Crowdfunding, and contributions are pooled together to reach the team’s overall goal (e.g., the Team Captain establishes a $10,000 team goal, and asks his/her ten team members to raise $1,000 via their own Crowdfunding and social network). Refers to a second generation of web-based communities and hosted services — such as social-networking sites, wikis, etc. — which aim to facilitate creativity, collaboration, and sharing among users. Enables information and funds from Crowdfunding and a nonprofit’s website to be downloaded directly into DonorPerfect and the nonprofit’s bank account – eliminating manual data entry. Personalized graphical icons fundraisers can put on their own websites and social sites (e.g., Facebook, MySpace, etc.) to promote contribution toward their fundraising goals.